Our record over the past 30 years speaks for itself. We are highly competitive in our price structure and can offer you next day delivery, free of charge, in a radius of 30 miles of Keighley. 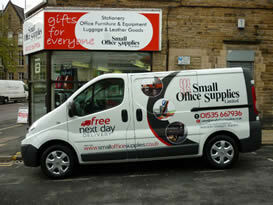 Nationwide we can offer you next day delivery at competitive rates. Our own brand Initiative range of stationery supplies enables us to offer you excellent value for money. Remember we are your stationery cupboard, it is no longer necessary for you to tie up money in stock. Just try us we will not let you down.